I've done a lot in the last month, and because my wrists kinda started hurting after typing up the Japan, Food, and Gender blog series, I haven't been super excited to update, but I feel like I have a duty to catch up a bit before I head off to Minakami, since I don't know what my internet situation will be like there. So this is basically going to be a list of everything I've done since New Years, and it's not going to be very detailed or exciting. 1) I went to see a kabuki play. I'm not sure what it was called, I think something like "The Eight Samurai," but there was also another shorter play afterwards that I didn't understand at all. I honestly didn't understand most of it, but it was fun to watch. The costumes and the staging were really interesting. Rather than trying to hide its stage hands, kabuki uses people dressed in black that you're supposed to pretend not to see. Someone told me that the idea of the black-clad ninja comes from kabuki, because one play had someone get assassinated by a ninja, and rather than being killed by a character, they had him be killed by a stage hand, and it really shocked people because they were so used to just not paying attention to the stage hands, so it was really like he'd been struck down by an invisible killer. 2) It snowed. 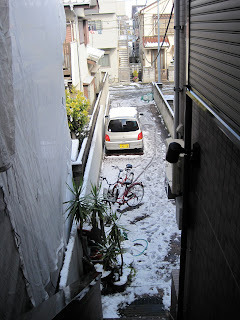 It's not unheard of for it to snow in Tokyo/Saitama/Chiba-area, but it doesn't happen very often. The snow all melted by the end of the day but it was fun to watch it through the window while I wrote a paper. 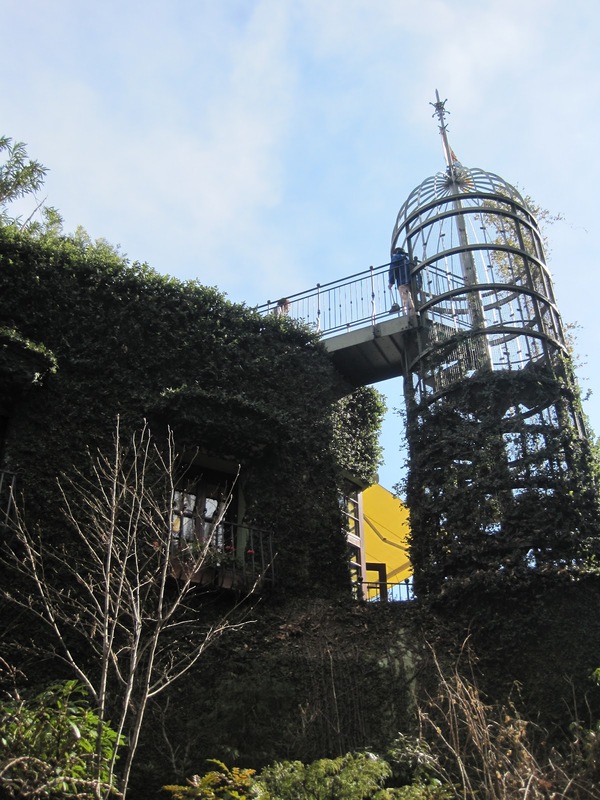 3) We went to the Ghibli Museum in Mitaka. It was a very cute museum, and if I could read Japanese faster I would have learned a lot about how animation is made, but we ended up staying there for 3 hours, so I got kinda bored and irritable. It also reminded me that I'd only seen a few Ghibli movies, so there was a lot I didn't care too much about. But the design of the museum was adorable. Outside the fake reception desk, run by Totoro. It was cold, but I'm the only one who looks cold. 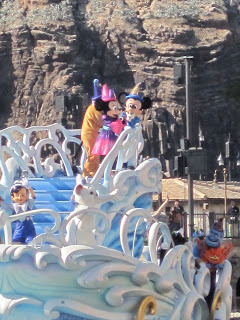 4) We went to Tokyo DisneySea. Thankfully, it's not a water park, just a different Disney park unique to Tokyo and close to the ocean. Apparently February was a good month to go because only college students are out of school, but we still had two hour lines for the big attractions. It was fun though, because it was the last time we got to hang out together before we all head off on our cultural practicums. 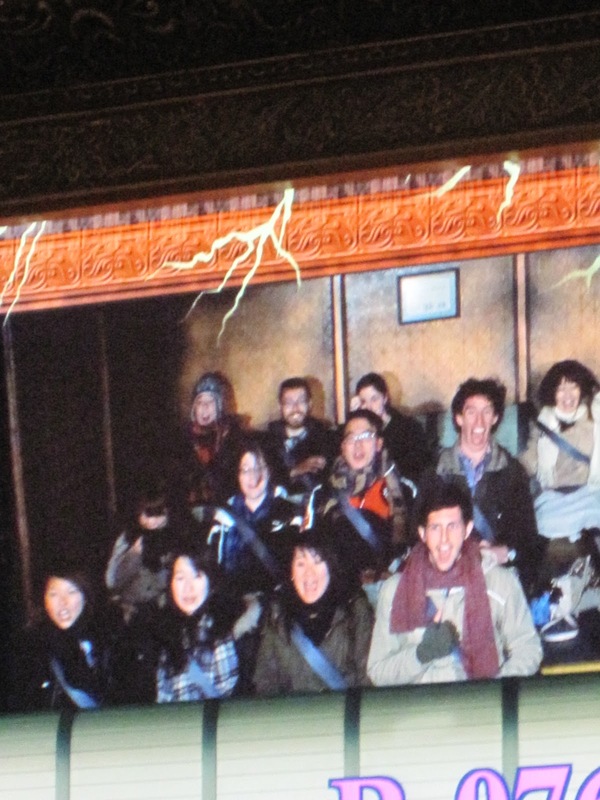 Almost all of us rode Tower of Terror together, and it was worth the 2 hour wait. Another highlight was getting there just in time to see the "Be Magical" show going on, where all the Disney characters glided around the lake in the middle on boats. I got good pictures because my camera zooms better than my vision. I had fun. 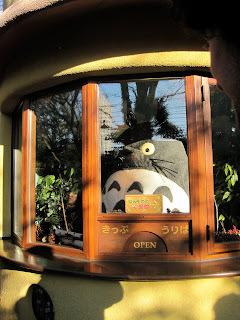 I would have liked to go to Disneyland and ride more of the classic roller coasters, but I would have probably spent the entire day in line instead of just most of it, and it was nice to see a place that was unique to Japan. 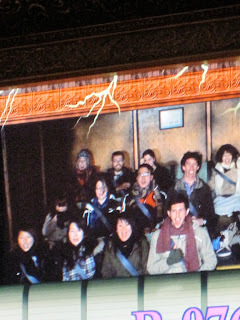 It was interesting, though, because English was still the dominant language despite it being a Japanese park. It was a long, long day. We got to the park at 11 and stayed until it closed at 10. And we had talked about going to dinner together, but everyone was a little worried about missing their last trains, so we grabbed some convenience store food and ate it together because this was the last time we'd all see some of the people who were only here for a semester. Then, Sam and I were still hungry, so when we finally got back to our home station at 12:30ish we had some gyu-don, and it was delicious because food always tastes better in the middle of the night. And I realized that I hardly ever hung out with Sam, which is stupid because we lived in the same town, and I'm still not sure if I'll see him between the time I get back from Minakami and the time I leave to go on a trip to Osaka. Well, that's the quick version of what I've been up to. I leave on Wednesday for my cultural practicum, and I'll keep you posted about that if I have internet access. Basically, I'm going to be doing some sort of work in this artisan crafts area of Minakami, and I'm living with another host family, and short of their address and the ages of the family members, I don't really know anything else. I'll be there for a month, so hopefully all will go well. A little while after I get back from Minakami, my friend Laura and I are taking a bus to Osaka and exploring there for a few days. We're also going to head to Kyoto for a day and rent kimono and go see some temples and things. I'm really excited.